Did Jez have a chance of acquittal? Well, he had a jury trial so that gave him some chance of an acquittal. Had it been a trial without a jury he would have had none. But even with a jury the odds were heavily against a not guilty verdict. In the minds of jurors must be the fear of being called a racist which has been so successfully inculcated in the general population that it produces an automated reflex of panic and terror when faced with the possibility of the label being put on them. Any juror faced with a case such as this must have it in the back of their minds at least that to return a not guilty verdict would be to risk being called a racist. There is also the sheer shock factor of hearing politically incorrect views being unashamedly spoken. As it was the jury was out for less than two hours and returned a unanimous verdict of guilty. The case was originally turned down by the Crown Prosecution Service (CPS) as not meting their evidential standard for a prosecution. The Campaign Against Anti-Semitism threatened the CPS with a judicial review of their decision not to prosecute. Faced with that the CPS caved in and prosecuted. It is worth noting that running a judicial review is very expensive. The fact that the CAA managed to get the CPS prosecute effectively creates two tiers of justice, that for the rich and that for the poor. 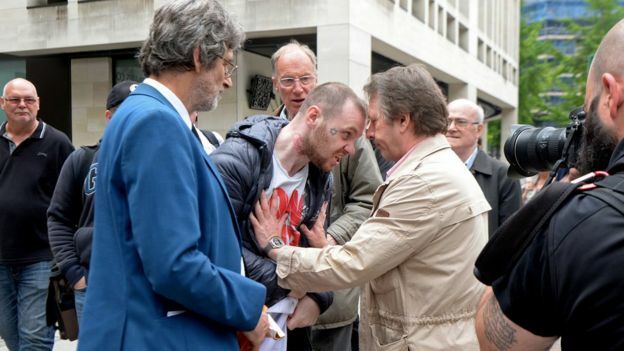 I shall be writing a fuller account of the trial later but I can say unequivocally that the judge showed his bias against Jezz from the word go in both his actions and manner. He began by refusing a request by Jezz’s barrister to put questions to prospective jurors to discover if any off them were members of the CAA or the Community Security Trust, a charity which has surprising support from the Met Police for a quasi-police group known as the Shomrim – see below. During this passage of the hearing the judge said with great distaste that it was shocking that such an organisation as the CAA needed to exist but that was the way of the world. The judge also intervened on a number of occasions when Jezz was being cross-examined to dispute what Jezz was saying.This was not his job, it was the job of the prosecutor to challenge what Jezz was saying. The other thing to note was the way both judge and prosecuting counsel accepted opinion as fact and were seemingly oblivious to what they were doing which in short was enforcing the politically correct view of the world. For example, prosecuting counsel thought nothing of quoting a senior judge that freedom of expression had to be compatible with the “standards of a just and fair multiracial society”. The other striking thing about this trial is the paucity of media comment. One might have thought the mainstream media would have jumped all over the matter but the only mainstream press attending the trial was the Press Association. Why? Well, I suspect it was because although the politically correct wanted the prosecution and a guilty verdict they did not want the politically incorrect nature of much of the evidence to come before the public’s eyes. Where does all this leave us? Free expression is essential to democracy and political freedom. Take it away and oppression soon fills the void. It also has a general cultural value. Its importance is examined in detail in my essay Freedom or permitted opinion below. . Beneath that you will find a number of reports of Jez’ trial and a couple on the truly amazing powers granted to the Shomrim both here and abroad. 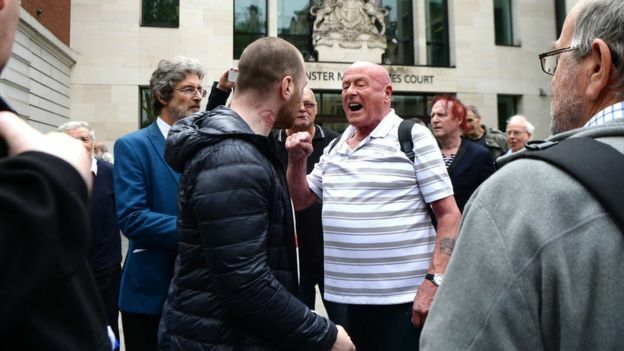 He averred for example that they were ‘spreading anti-semitic hatred’ and were ‘inciting to racial hatred.’ The Court was not given evidence for this,nor advised where or in whom these emotions were being generated. Should he not have called witnesses to testify in support of these conjectures, or better still a psychologist to affirm that they were or had been generated? The Defence lawyer Adrian Davies had suggested at an earlier hearing that his client’s songs might be ‘offensive’ but not ‘grossly offensive,’ and that remark was reiterated by the judge in the present hearing. That is surely so: it’s not as if they were snuff movies, or featured depraved or perverted acts, or personally defamed anyone living — except for one person, Irene Zisblatt who claims that she swallowed diamonds while she was at Auschwitz. The court discussed her case, with Mr Davies pointing out that the official Yad VashemHolocaust centre in Israel had cast doubt upon the veracity of Ms Zisblatt’s story in her book The Fifth Diamond. It features of course ze evil Nazis ripping babies in half, making lampshades out of human skin, etc. Was this not a legitimate target for satire, Mr Davis asked the Court? The Jews have earned the right to control much of the Western world, and do they control much of Western Europe and North America , but anyone critical of this control must be silenced! Gilad Atzmon highlights the hypocrisy and double standards flagged up by the persecution of Jez Turner. To say that UK police handling of online abuse is inconsistent is something of an understatement. 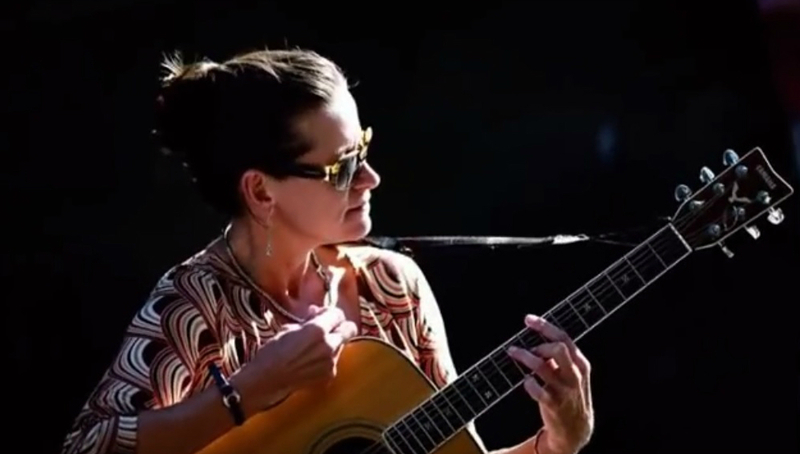 In particular, these inconsistencies are highlighted in the case of British musician, Alison Chabloz, who shot to fame after performing a “quenelle” salute at the Edinburgh Fringe festival in 2015. Chabloz was again in the news during this year’s Fringe after her show was pulled for being “too political”. 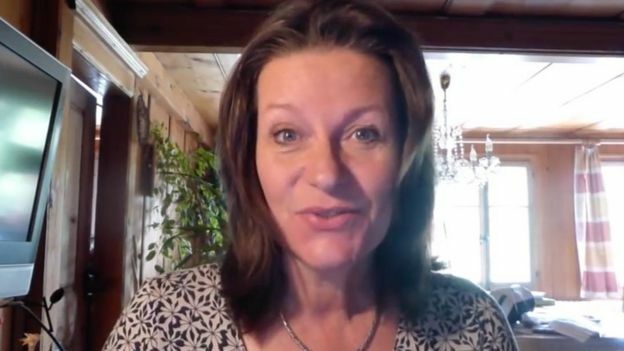 Victim of targeted harassment and abuse from vicious, pro-Israel “advocates” as well as from a host of anonymous Hasbara “Ziotrolls” and assorted Leftist, liberal “social justice warriors”, Chabloz was recently informed by her local police force in Derbyshire that their investigation for malicious communications and harassment regarding this online abuse against Chabloz had been closed. The investigation began earlier this year after Chabloz had received several unwanted postal deliveries, including anonymous birthday and Christmas cards as well as several sales catalogues (e.g. for reinforced doors and blinds) addressed to her in a derogatory manner. Ten days after receiving news of the now closed case, Chabloz was arrested by local police in an investigation involving two other forces. She was questioned and detained for six hours – more than two hours spent locked in a cell – learning on her release at midnight that during this time police had raided her domicile and seized her laptop. 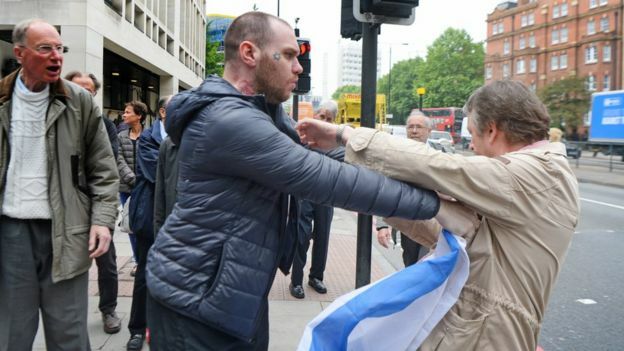 Chabloz’ hate crime, allegedly, concerns both her 15-month old ” quenelle” as well as songs performed at London’s Grosvenor Hotel last September during a meeting of The London Forum. Asides the allegation of incitement, Chabloz was also arrested and questioned on suspicion of online harassment of two of her critics. Chabloz’ solicitor said no evidence of any such harassment was presented during the interview. In fact, as early as 2014, Chabloz had been advised by the Musicians’ Union to report to police after being fired by Carnival Group for a satirical tweet posted six months before she began working for the company. Both in the above case along with several other subsequent incidents of online harassment, including death threats and further attempts to prevent Chabloz from performing, Derbyshire police failed to take appropriate action against the perpetrators. With her laptop now in police hands, Chabloz’ gigs are on hold because the device contains all her sheet music, backing tracks and software vital for her performances. Chabloz’ solicitor has submitted a legal request to try and recuperate the device and a mobile phone also seized. Chabloz has been bailed till January 12 pending a decision by the Crown Prosecution Service. 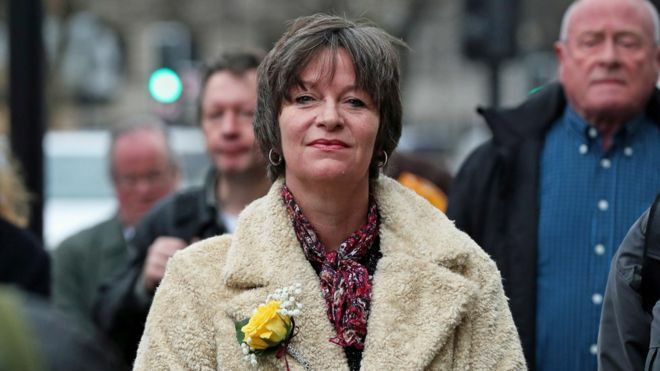 As well, November 19, Chabloz received a court summons to appear in front of Westminster Magistrates Court in a private prosecution brought against her by Gideon Falter, director of UK registered “charity” Campaign Against Antisemitism. Falter accuses Chabloz of using social media to cause offense in breach of the 2003 Communications Act after Chabloz posted a video of her song (((Survivors))) on YouTube. The song has gained over six million – sorry, six thousand views views so far.